Editor’s Note: In this article, Mr. Steve Hill highlights a recent webinar where Dr. Aubrey de Grey, the Biogerontology Advisor of the U.S. Transhumanist Party / Transhuman Party, revised his projections for the arrival of rejuvenation treatments in a more optimistic direction. This article was originally published by the Life Extension Advocacy Foundation (LEAF). On January 28, 2019, we held a webinar with the SENS Research Foundation as part of a new ongoing series of research webinars. During the webinar, we asked Dr. Aubrey de Grey how close we might be to achieving robust mouse rejuvenation (RMR) and robust human rejuvenation, and his answer was somewhat surprising. RMR is defined as reproducibly trebling the remaining lifespan of naturally long-lived (~3 years average lifespan) mice with therapies begun when they are already two years old. Dr. de Grey now suggests that there is a 50/50 chance of achieving robust mouse rejuvenation within 3 years from now; recent interviews and conversation reveal that he’d adjusted this figure down from 5-6 years. He has also moved his estimation of this to arrive from around 20 years to 18 years for humans. So, what is the basis for this advance in schedule? Dr. de Grey is more optimistic about how soon we might see these technologies arrive, as the level of crosstalk between damages appears to be higher than he originally anticipated a decade ago. This means that robust mouse and human rejuvenation may be easier than he previously believed. We also asked Dr. de Grey which of the seven damages of aging was the most challenging to address. Originally, he thought solving cancer through OncoSENS methods was the biggest challenge in ending age-related diseases. However, intriguingly, he speaks about his enthusiasm for immunotherapy and how it may potentially solve the cancer issue and negate the need for Whole-body Interdiction of Lengthening of Telomeres (WILT), which was always considered a last-resort approach to shutting down cancer. There are two main components of the WILT approach. The first is to delete telomerase-producing genes from as many cells as possible, as human cancers lengthen telomeres through one of two available pathways, and the second is to avoid the harmful consequences of our cells no longer having telomerase by periodically transplanting fresh stem cells, which have also had their telomerase-associated genes knocked out, to replace losses. This approach has always been considered extreme, and Dr. de Grey has always acknowledged that this was the case. However, over a decade ago when Dr. de Grey and Michael Rae originally proposed this in the book Ending Aging, immunotherapy was simply not on the radar. Now, there are alternatives to WILT that show true potential and less need for radical solutions, and it is reassuring to see that Dr. de Grey is so enthusiastic about them. He now suggests that MitoSENS is probably the most challenging to tackle of the seven types of damage in the SENS model of aging. This is no surprise given that DNA and mtDNA damage are highly complex issues to fix. On that note, we asked Dr. Amutha Boominathan from the MitoSENS team which mitochondrial gene was their next target after they had successfully created nuclear copies of the ATP-6 and ATP-8 genes. MitoSENS will be launching a new fundraising campaign on Lifespan.io later this year with the aim of raising funds to progress to more of the mitochondrial genes. This time, the aim will be to move the approach to an animal model and demonstrate how it could be used to correct mitochondrial defects. Finally, if you are interested in getting involved directly with these webinars and joining the live audience, check out the Lifespan Heroes page. As a scientific writer and a devoted advocate of healthy longevity technologies, Steve has provided the community with multiple educational articles, interviews and podcasts, helping the general public to better understand aging and the means to modify its dynamics. His materials can be found at H+ Magazine, Longevity reporter, Psychology Today and Singularity Weblog. He is a co-author of the book “Aging Prevention for All” – a guide for the general public exploring evidence-based means to extend healthy life (in press). This interview was originally published here. What is ageing? We can define ageing as a process of accumulation of the damage which is just a side-effect of normal metabolism. While researchers still poorly understand how metabolic processes cause damage accumulation, and how accumulated damage causes pathology, the damage itself — the structural difference between old tissue and young tissue — is categorized and understood pretty well. By repairing damage and restoring the previous undamaged — young — state of an organism, we can really rejuvenate it! It sounds very promising, and so it is. And for some types of damage (for example, for senescent cells) it is already proved to work! Today in our virtual studio, somewhere between cold, rainy Saint-Petersburg and warm, sunny Mountain View, we meet Aubrey de Grey, again! For those of you who are not familiar with him, here is a brief introduction. Dr Aubrey de Grey is the biomedical gerontologist who researched the idea for and founded SENS Research Foundation. He received his BA in Computer Science and Ph.D. in Biology from the University of Cambridge in 1985 and 2000, respectively. Dr. de Grey is Editor-in-Chief of Rejuvenation Research, is a Fellow of both the Gerontological Society of America and the American Aging Association, and sits on the editorial and scientific advisory boards of numerous journals and organizations. In 2011, de Grey inherited roughly $16.5 million on the death of his mother. Of this he assigned $13 million to fund SENS research. Note: If you have not read “Ending Aging” yet I suggest you to do it as soon as possible, and to be more comfortable with the ideas we are discussing below I highly recommend you to read short introduction to SENS research on their web page. Also if you are interested in recent news and up-to-date reviews about [anti]ageing and rejuvenation research the best place to look for is Fight Aging! blog. Finally, if you are an investor or just curious, I highly encourage you to take a look at Jim Mellon’s book “Juvenescence”. Ariel Feinerman: Hello, Dr Aubrey de Grey! Aubrey de Grey: Hello Ariel — thanks for the interview. Ariel Feinerman: How do you feel 2018 year? Can you compare 2018 to 2017 or early years? What is changing? Aubrey de Grey: 2018 was a fantastic year for rejuvenation biotechnology. The main thing that made it special was the explosive growth of the private-sector side of the field — the number of start-up companies, the number of investors, and the scale of investment. Two companies, AgeX Therapeutics and Unity Biotechnology, went public with nine-digit valuations, and a bunch of others are not far behind. Of course this has only been possible because of all the great progress that has been made in the actual science, but one can never predict when that slow, steady progress will reach “critical mass”. Ariel Feinerman: In 2017 SENS RF have received about $7 million. What has been accomplished in 2018? Aubrey de Grey: We received almost all of that money right around the end of 2017, in the form of four cryptocurrency donations of $1 million or more, totalling about $6.5 million. We of course realised that this was a one-off windfall, so we didn’t spend it all at once! The main things we have done are to start a major new project at Albert Einstein College of Medicine, focused on stem cell therapy for Alzheimer’s, and to broaden our education initiative to include more senior people. See our website and newsletters for details. Ariel Feinerman: What breakthroughs of 2018 can you name as the most important by your choice? Aubrey de Grey: On the science side, well, regarding our funded work I guess I would choose our progress in getting mitochondrial genes to work when relocated to the nucleus. We published a groundbreaking progress report at the end of 2016, but to be honest I was not at all sure that we would be able to build quickly on it. I’m delighted to say that my caution was misplaced, and that we’ve continued to make great advances. The details will be submitted for publication very soon. Ariel Feinerman: You say that many of rejuvenating therapies will work in clinical trials within five years. Giving that many of them are already working in clinical trials or even in the clinic (like immunotherapies, cell and gene therapies) do you mean the first — maybe incomplete — rejuvenation panel, when you speak of early 2020? Aubrey de Grey: Yes, basically. SENS is a divide-and-conquer approach, so we can view it in three overlapping phases. The first phase is to get the basic concept accepted and moving. The second phase is to get the most challenging components moving. And the third phase is to combine the components. Phase 1 is pretty much done, as you say. Phase 2 is beginning, but it’s at an early stage. Phase 3 will probably not even properly begin for a few more years. That’s why I still think we only have about a 50% chance of getting to longevity escape velocity by 2035 or so. Ariel Feinerman: Even now many investors are fearful of real regenerative medicine approaches. For example pharmacological companies which use small molecules, like Unity Biotechnology, received more than $300 million, in much more favour than real bioengineering companies like Oisin Biotechnologies, received less than $4 million, even though the biological approach is much more powerful, cheap, effective and safe! Why is this so in your opinion, and when can we see the shift? Aubrey de Grey: I don’t see a problem there. The big change in mindset that was needed has already occurred: rejuvenation is a thing. It’s natural that small-molecule approaches to rejuvenation will lead the way, because that’s what pharma already knows how to do. Often, that approach will in due course be overtaken by more sophisticated approaches. Sometimes the small molecules will actually work well! It’s all good. Ariel Feinerman: Do you agree that the small-molecule approach is generally the wrong way in the future rejuvenation therapies? Because they have many flaws — especially their main mechanism via interference with human metabolism. Unlike them SENS bioengineering therapies are designed to be metabolically inert — because they just eliminate the key damage, they do not need to interfere with metabolism, so it is much easier than usual to avoid side effects and interactions with other therapies. They just eliminate the key damage, which means they are easier to develop and test — and much safer. Aubrey de Grey: Ah, no, that’s too simplistic. It’s not true that small molecules always just “mess with metabolism” whereas genetic and enzymatic approaches eliminate damage. Small molecules that selectively kill senescent cells are absolutely an example of SENS-esque damage repair; the only thing against them is that it may be more difficult to eliminate side-effects, but that’s not because of their mode of action, it’s because of an additional action. Ariel Feinerman: In recent years many countries gave the green light for regenerative medicine. Fast-track approval in Japan, for example, allows for emerging treatments to be used so long as they have been proven safe. The similar approach works in Russia. What about the EU or USA? Aubrey de Grey: There’s definitely a long way to go, but the regulatory situation in the West is moving in the right direction. The TAME trial has led the way in articulating an approvable endpoint for clinical trials that is ageing in all but name, and the WHO has found a very well-judged way to incorporate ageing into its classification. Ariel Feinerman: Do you think of working with USA Army? As far as we know they conduct research on regeneration and are very interested in keeping soldiers healthier for longer. And they have much money! Aubrey de Grey: The Department of Defense in the USA has certainly funded a lot of high-impact regenerative medicine research for many years. I’m sure they will continue to do so. Ariel Feinerman: Is any progress in the OncoSENS programme? Have you found any ALT genes? Is any ongoing research in WILT? Aubrey de Grey: No — in the end that program was not successful enough to continue with, so we stopped it. There is now more interest in ALT in other labs than there was, though, so I’m hopeful that progress will be made. But also, one reason why I felt that it was OK to stop was that cancer immunotherapy is doing so well now. I think there is a significant chance that we won’t need WILT after all, because we will really truly defeat cancer using the immune system. Ariel Feinerman: Spiegel Lab has recently published an abstract where they say they have found 3 enzymes capable of breaking glucosepane. Very exiting info! When can we hear more on their research? Revel LLC is a very secretive company. Aubrey de Grey: They aren’t really being secretive, they are just setting up. Ariel Feinerman: When can we see the first clinical trial of glucosepane breaker therapy? Aubrey de Grey: I think two years is a reasonable estimate, but that’s a guess. Ariel Feinerman: What do you think of the Open Source approach in rejuvenation biotechnology? The computer revolution in the early 2000s has taken place only because Open Source caused an explosion in software engineering! We have many examples when Big Pharma buys a small company which has patents on technology and then cancels all research. In the Open Source approach you cannot “close” any technology, while everyone can contribute, making protocol better and everyone can use that without any licence fee! Anyway, there are countries where you cannot protect your patents. Maybe it will be better to make technology open from the beginning? Aubrey de Grey: I think you’ve pretty much answered your own question with that quote. The technologies that will drive rejuvenation are not so easy to suppress. Ariel Feinerman: Is the SENS RF going to begin new research programmes in 2019? Aubrey de Grey: Sure! But we are still deciding which ones. We expect that our conference in Berlin (Undoing Aging, March 28–30) will bring some new opportunities to our attention. Ariel Feinerman: What are your plans for 2019? Aubrey de Grey: I’d like to say less travelling, but that doesn’t seem very likely at this point. Really my goal is just to keep on keeping on — to do all I can to maintain the growth of the field and the emerging industry. Ariel Feinerman: Thank you very much for your answers, hope to see you again! Aubrey de Grey: My pleasure! Ariel VA Feinerman is a researcher, author, and photographer, who believes that people should not die from diseases and ageing, and whose main goal is to improve human health and achieve immortality. If you like Ariel’s work, any help would be appreciated via PayPal: arielfeinerman@gmail.com. Editor’s Note: The U.S. Transhumanist Party features this announcement by the Undoing Aging Conference, a joint project between the SENS Foundation and the Forever Healthy Foundation, originally published on their site on April 2, 2019. The Undoing Aging Conference is focused on the cellular and molecular repair of age-related damage as the basis of therapies to bring aging under full medical control. Undoing Aging 2020 will once again bring together scientists and startups from around the globe, all pioneers in their respective fields, who are leading the charge in maintaining and restoring full health in old age. Such research is supported by the U.S. Transhumanist Party as part of our policy goals. After the incredible success of the 2019 Undoing Aging Conference, SENS Research Foundation and Forever Healthy Foundation are pleased to announce Undoing Aging 2020, which will take place on May 21 – 23. 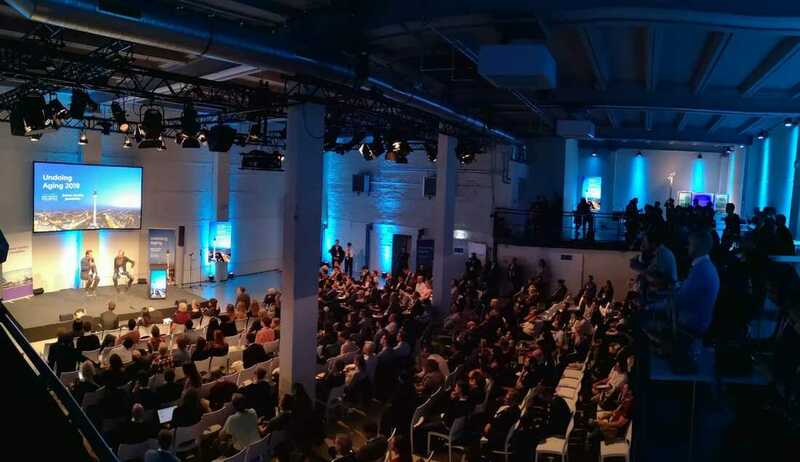 As UA2019 was sold out with nearly 500 participants from over 30 countries, Undoing Aging 2020 will be moving to a larger venue. The Undoing Aging Conference is focused on the cellular and molecular repair of age-related damage as the basis of therapies to bring aging under full medical control. Among the 40 brilliant speakers at Undoing Aging 2019, there were giants in regenerative medicine such as: Dr. Nir Barzilai, Dr. Jerry Shay, Dr. Evan Snyder, Dr. Judith Campisi, and many more. Undoing Aging 2020 will once again bring together scientists and startups from around the globe, all pioneers in their respective fields, who are leading the charge in maintaining and restoring full health in old age. To accommodate the exciting growth of the emerging rejuvenation biotechnology industry, Undoing Aging 2020 will add a dedicated forum and exhibition space for rejuvenation biotech companies to present themselves to prospective investors and industry partners. Additionally, the 2020 conference will add a special “Rejuvenation Now” session highlighting the first generation of human rejuvenation therapies that are either currently in clinical trials or are available today. Undoing Aging 2020 is not only open to the scientific community, but also welcomes startups, investors, the general media, and all interested members of the broader rejuvenation movement. The conference will feature a student poster session showing the work of innovative undergraduate and graduate students in the field of damage repair. “The accelerating rate of progress in rejuvenation research is now unmistakeable at all levels: publications, transfer into rapidly-funded startup companies, and even into the clinic. One marker of this is the worldwide proliferation of conferences focused on it. But I have no doubt that Undoing Aging will maintain its pre-eminence among them, with its strong focus on the most cutting-edge science, its long history dating back to my first Cambridge conference in 2003, and above all its steadfast support from Forever Healthy,” said Dr. Aubrey de Grey, CSO of SENS Research Foundation. Forever Healthy is a private, non-profit initiative with the mission to enable people to vastly extend their healthy lifespan and be part of the first generation to cure aging. Thru its ‘Rejuvenation Now‘ and ‘Maximizing Health‘ initiatives, Forever Healthy seeks to continuously identify and evaluate new rejuvenation therapies on risks, benefits, and potential application and to harness the enormous wealth of the world’s cutting-edge medical knowledge to empower informed decisions about health and well-being. SENS Research Foundation is a 501(c) nonprofit that works to research, develop and promote comprehensive regenerative medicine solutions for the diseases of aging. The foundation is focused on a damage-repair paradigm for treating the diseases of aging, which it advances through scientific research, advocacy, and education. To stay updated on Undoing Aging, you can follow their facebook page. Editor’s Note: The U.S. Transhumanist Party features this announcement by our cohorts at the Life Extension Advocacy Foundation, originally published on their site on March 19, 2019. The program helps bring attention to published works promoting the mission of ending age-related diseases, a mission the U.S. Transhumanist Party supports as part of our policy goals. As mentioned in some recent articles, we are increasing our efforts to reward our loyal and invaluable monthly patrons that support us as Lifespan Heroes. We previously mentioned a brand-new, exclusive webinar series for Lifespan Heroes, and we want to take this opportunity to also announce another brand-new initiative that will commence in April. As special thanks to our Lifespan Hero patrons, we are pleased to announce the launch of our new Longevity Book Club, where you can join other longevity enthusiasts in reading the most interesting works that relate to our mission of ending age-related diseases. You will also get the opportunity to listen to discussion panels and take part in Q&A sessions that are focused on books that touch on these important scientific, philosophical, moral and futuristic longevity topics. This is the ideal place to meet like-minded longevity enthusiasts who are working on building their knowledge on longevity and all of the implications that come with ending age-related diseases. Our first book circle will be reading Homo Deus: A Brief History of Tomorrow by Yuval Noah Harari, a New York Times best-selling author. Over the past century, humankind has managed to do the impossible and rein in famine, plague, and war. This may seem hard to accept, but, as Harari explains in his trademark style—thorough, yet riveting—famine, plague and war have been transformed from incomprehensible and uncontrollable forces of nature into manageable challenges. For the first time ever, more people die from eating too much than from eating too little; more people die from old age than from infectious diseases; and more people commit suicide than are killed by soldiers, terrorists and criminals put together. The average American is a thousand times more likely to die from binging at McDonalds than from being blown up by Al Qaeda. We feel this is a good book to get started with, as it’s written in a user-friendly style that can appeal to a broad audience and touches on many topics that are directly or indirectly related to our mission of ending age-related disease. As we progress as a group, we will shift into different categories, including philosophy, genetics, biochemistry, ethics, and many more topics that are of interest to our mission and book club members. As a Hero, you will have the opportunity to join us for the first of many book discussions and have the opportunity to learn about the fascinating knowledge that these authors have to share with us as well as the deconstructed meanings behind the books as seen by our book club members. We’ll email the connection instructions to our Heroes soon, so please check your inbox for our announcement. This year, our plan is to reach out to an even wider audience and engage with them about the need to end age-related diseases. We aim to hire another team member so that we can cover more news stories, buy new equipment, produce more films with popular Youtube channels, launch a two-day conference in NYC, and do more online shows, including this new webinar series. However, to do this, we need your help. We are very grateful for the support of our monthly patrons, the Lifespan Heroes, and we are asking you to consider joining them today in order to help us achieve our ambitious goals for 2019. By becoming a Lifespan Hero, you become a monthly patron and can change or halt your contributions at any time. In return for your support, you get access to the Heroes’ private Discord channel, enjoy discounts on our event tickets, get early access to conference videos and live access to webinars, and receive regular reports on our progress and future plans. Please consider becoming a Lifespan Hero today. We look forward to seeing you at the MitoSENS webinar and our Longevity Book Club meetings. In the quest to transcend humankind’s limits and take humanity to its next level of development physically, mentally, emotionally and socially, much is written and discussed about topics such as life extension and human augmentation. And this is for good reason, as humans have strived, since the beginning of time, to overcome their limits, do more, and be better. This includes, of course, living longer and healthier, which is among the most noble of all human goals. However, in the midst of all this, there is a topic that is seldom discussed in Transhumanist circles, and that is the topic of depression, a condition which, according to the World Health Organization (WHO), affects more than 300 million people worldwide. Making matters worse is the fact that depression is the leading cause of disability worldwide, a major contributor to disease, and in some cases, leads to suicide. Given these facts, one would think more should be done to combat the plague of depression, but alas, we appear to be stuck with outdated treatments for a condition that cripples large segments of humanity and for many, threatens the very possibility of living longer and healthier. Contrary to what many people may believe, an individual suffering from depression cannot simply “snap out of it,” and there is, as of yet, no established cure for depression, as there is for diseases such as smallpox. Indeed, depression is a particularly thorny problem to solve for many reasons, which include the fact that diagnosing it isn’t as cut and dried as other conditions, but also that the treatments for it have thus far not been very efficacious. Those treatments include pharmacological (selective serotonin reuptake inhibitors, or SSRIs, such as Paxil, Prozac, and Zoloft), non-pharmacological (cognitive behavioral therapy), and technological (cranial electrotherapy stimulation) solutions. However, if we are honest with ourselves, the data reveals that what we have been doing hasn’t been very effective, given that depression is on the rise worldwide. According to the WHO, the total estimated number of people living with depression worldwide increased by 18.4 percent between 2005 and 2015 to 322 million. Even if this increase is due to better and more accurate diagnoses, the incidence of depression isn’t decreasing, which is cause for concern. Given these statistics, it is time to do something other than what has been done before. It is time for a new approach and a new way of thinking when it comes to treating and curing depression. Transhumanism may offer that light at the end of the tunnel. Indeed, Transhumanism may very well be humanity’s best hope for a cure for depression, because it leaves no stone unturned in the quest to live a life of fewer limits, as well as improved health, and greater happiness and fulfillment. Imagine what could be done to solve depression if we approached treatment and a cure not in the standard ways, but by harnessing the full power of science and technology to do whatever it takes to assist the hundreds of millions of people who are suffering. For instance, why is the technology of deep brain stimulation approved for treating Parkinson’s Disease, which, according to the Parkinson’s Foundation, affects 10 million people worldwide, but not approved for treating depression, which affects more than 300 million people globally? Scientific and technological breakthroughs should be leveraged to relieve the suffering of all people, and not just a few. This is the promise of Transhumanism – that all humans are worthy of a cure for what ails them, and therefore, all people inflicted with depression should get the help they need so that they can transcend the condition that threatens to wreck their lives. Why is it that the most commonly-prescribed treatments for post-traumatic stress disorder (PTSD), which are the SSRIs Paxil and Zoloft, require daily dosing for many weeks to months, and have little to no effect in curing PTSD? On the other hand, MDMA-assisted psychotherapy, conducted by the Multidisciplinary Association for Psychedelic Studies (MAPS), has been proven to treat PTSD successfully in two to three sessions, yet it remains illegal as a Schedule 1 drug. This is the promise of Transhumanism – that we should look for creative, out-of-the-box ways to relieve suffering, which includes pharmacological, non-pharmacological, technological, and scientific methods. If we are really serious about curing depression, as opposed to just putting bandages on a gaping wound in humanity’s well-being, we will have to do much more than we are doing right now, and we will have to reassess the way we are treating depression. But why focus on depression, besides the fact that it destroys the lives of many millions of people and the treatments so far have been ineffective in curing it? Because depression does not care whether you are young or old, whether you are black or white, whether you are rich or poor, and whether you are physically healthy or not. Depression is an equal-opportunity destroyer of life. While heart attacks and pancreatic cancer may end lives quickly, depression ends lives slowly, ruthlessly robbing people of their happiness, sadistically stripping away their dignity, and mercilessly beating and drowning them in a dark, dreary swamp with little hope for a better future. It is inhuman to ignore the plight of those suffering from depression and to give up the fight for a brighter, happier future for every individual on Earth. Transhumanism not only offers hope for a better future through inspiring and motivating humans to transcend their limits, but it also encourages us to look at problems from many different angles, and to dedicate our efforts toward actually resolving the challenges that humanity is facing. Many Transhumanists are, understandably, focused on life extension and reversing aging, since life is the most precious thing we have. But life is a lot less beautiful when one is trapped in an inescapable labyrinthine nightmare, enfeebling one’s mind and tormenting one with endless movie-like scenes of their perceived past failures. In a sense, some people with depression feel there is not much point in attempting to extend their lives when they are continuously engulfed in profound sadness. But the truth of the matter is that it is not people suffering from depression who have failed; it is we as a society who have failed them. One of the ways we can rectify this situation and offer a real solution for those battling depression is by advocating for and creating breakthrough technologies and medicines that will successfully treat and cure this dreadful condition that has ruined so many precious, promising lives. Transhumanism is not just about advocating for life extension, it is also about advocating for a better quality of life through leveraging advances in science and technology to treat conditions such as depression. The dawn of every new year brings renewed hope and numerous promises made by individuals across the world to improve their lot in life, whether through increased exercise, a new diet, or a career change. However, according to extensive research conducted on the topic, most of these resolutions are seldom kept long-term, and many people eventually revert back to old habits and modes of thought. While failing to keep a promise to oneself to find a new job may not have catastrophic consequences for that person, an entire society or parts of the world falling short of goals such as reversing climate change may have disastrous implications for the rest of the world. However, this article isn’t necessarily about saving the world. It’s about a topic that is very near and dear to me; specifically, personal responsibility, especially when it comes to longevity. Whether we read about this topic, discuss it with others, watch interviews with experts and laypeople, or read polls, almost everyone would agree that the idea of living longer and healthier is very appealing to them. Why is it, then, that observing people’s actions reveals that many of us do things that will prevent us from living longer and healthier? Why do so many people who claim longevity is important to them turn around and engage in behaviors such as overeating, smoking tobacco products, not exercising regularly, and so on? Thankfully, there are some people out there who take longevity and health seriously, and these individuals eagerly follow new developments and hope for the scientific breakthroughs that will finally reverse aging and cure debilitating diseases that have plagued humankind for so long. However, the first step toward curing disease and reversing the process of aging does not start with the chemists who come up with new medicines or the gerontologists who study aging or the governments that fund projects; it starts with the individual. If you don’t believe me, simply take a closer look the next time you are at a restaurant or supermarket and observe what many people are purchasing and putting in their bodies. You may well be shocked at the sorts of things we are consuming on a daily basis. Several decades ago, there was a fear that humanity would face starvation on a global scale, but that threat never materialized. In fact, we now have far more food than we know what to do with. Indeed, our problem isn’t that we do not have enough food, it is that we have too much food, and too much of what we consume is unhealthy, thus reducing our life span and health span. Even if we may not want to admit it, the first step toward living a longer and healthier life is entirely in our hands. The actions we take on a daily basis determine, in no small part, whether we can put ourselves in a situation to take advantage of the advances in medicine and technology that may cure us of disease and reverse the process of aging in our bodies and minds. In my humble opinion, it is irresponsible for someone to neglect their health and well-being while at the same time waiting and hoping for a cure for aging or disease. There is, currently, no magic pill one can take that will cure them of poor health or magically reverse aging. Thus, the impetus is on each person to do all they can to take care of themselves and their health, while the organizations and individuals that are working on curing disease and reversing aging come up with the requisite scientific and technological breakthroughs. In fact, we could even argue that in addition to managing one’s health and diet very closely, we should do more to support the organizations and individuals dedicated to curing disease and reversing senescence, but that is perhaps another topic for another time. Of course, by focusing on personal responsibility, I do not wish to ignore the numerous situational and socioeconomic factors that may contribute to people being unable to fully take responsibility for their health. Some people, due to conditions such as extreme poverty, are not in a position to take control of their lives in the way those of us in developed countries are able to. Similarly, though, I do not wish to ignore the plight of many residents of developed countries who face hardships (of the medical variety or otherwise) every day that prevent them from fully taking the advice in this article. Life is not black-and-white, but rather, gray, and I would never advocate for the law of the jungle in any society. Thus, I also want to make clear that we as a society should do whatever we can to ensure that people who need medical care receive the care that they need, in a cost-effective and dignified manner. In a world of abundance, there is no reason why people suffering from curable conditions (or otherwise) should go untreated, and no reason why anyone should be bankrupted by medical bills. However, these are not the persons I have dedicated this article to. A tragedy of modern life is that so many people are easily able to make changes in their life that would lead to a healthier and longer life, but instead choose to not do so, and continue engaging in destructive behaviors. Regardless of your views on disease and aging, it is not unreasonable to say that we should, at the very least, do whatever is in our power to take care of our own health. Therefore, the next time you think about gorging yourself on donuts and guzzling the soda offered at the next company party, you might want to reconsider, because what many people are eating and drinking is literally killing them. The next time you decide to sit at home and watch TV instead of doing 20 minutes of light exercise at the park or the gym, remember that lethargy has consequences. The next time you tell yourself “I’ll quit smoking someday,” or “I’ll start exercising when I have more time,” please pause for a moment and ask yourself whether you are really being honest. I do not wish to insinuate that we should try to be perfect all the time when it comes to health, diet, and exercise. Indeed, there is no way to get it right all the time, and the occasional piece of cake or glass of beer won’t derail your journey toward good health if you’re consistently and methodically taking good care of yourself. Rather, what I believe we should strive for is doing the best that we can on a daily basis, and if we need to make minor changes, to take small steps toward improvement every day. There is a famous quote attributed to Mahatma Gandhi that goes, “You must be the change you wish to see in the world.” I agree wholeheartedly, and would add that we must be the change we wish to see in ourselves. Because no one is more responsible for your own personal well-being than you. And no one can do as much for your own longevity as you can. I celebrated the end of 2018 like normally with neuroscientist Anders Sandberg and several other “transhumanists” or “technoprogressive people” in Stockholm! As people reading this know, the vast majority of human misery worldwide today occurs due to our bodies damaging themselves with the passage of time, the biological process we call aging. This occurs because evolution has no goals and our ancestors died at the age of 30-40 prehistorically, and therefore there was no pressure for evolution to create humans that could repair themselves molecularly to live thousands of years. The closest we get among Eukaryotes/Vertebrates are Greenland sharks, which can live to 500+ years; that is easy to understand since they have no predators and just have to open their mouths to get their daily food. On the opposite side we have as a prominent example the mouse, with a very poor molecular repair system and subsequent 2.5-year lifespan, easy to understand when you realize how dangerous life is in the wild if having a mouse body. Thanks to our technology, we have created the “paradise Greenland shark scenario” for humans during the past century essentially, creating very comfortable existences where nearly everyone survives. So if you’re 25 years old, life is really great nowadays in Western countries (unless you like to complain about everything! ); the existential risks are so low in the absence of aging that you would live many thousands of years just by being a young person living in Sweden. So I’ve worked a lot in nursing homes both before and during my studies in molecular biology, and what those people have to endure would be strictly illegal in most countries if we knew how to change it. Imagine if, for example, Saudi Arabia allowed its citizens to age while the Western world had abolished it; wouldn’t Amnesty International intervene? But what can be done with the human body? Well, I assume quite a lot! We are seeing so many people who can’t stand the medical monopoly and the 17-year bench-to-bedside status quo, which isn’t an abstract academic complaint but which impact their daily lives, so they start self-experimenting with, for example, senolytic medicines to kill their senescent cells, making themselves “younger” in certain aspects, which is pretty cool! However I’m not someone who constantly calls for change and “progress”; I mean, if something is nice, then why not keep it? As far as I’m concerned, for example, the beautiful architecture from the past can continue to stand for thousands more years. These buildings fulfill their purpose and look nice; I’m quite conservative on those points – but please accelerate the medical research, and it is crucial to spot the techniques that actually do work and to not waste resources on hype! I’ve been learning a lot about CRISPR and many other techniques both practically and theoretically, though I have not exactly used them to change the world. Medical progress takes forever to achieve, and it’s not exactly helped by a massive web of bureaucracy/hierarchies/prestige/laws, all contributing to slowing down progress for people in need. What can really be done? One needs to focus on the positive and go where the biotech companies can succeed! So if things are working out for me as I hope now in 2019, I hope being able to really work full time to impact the longevity industry, I really feel like an overripe fruit that needs to get things done, because implementing stuff is what matters and not becoming some passive “longevity encyclopedia”. I’ll keep everyone as usually updated! So happy new 2019 everyone! And make sure to take good care of yourselves! Victor Bjoerk has worked for the Gerontology Research Group, the Longevity Reporter, and the Fraunhofer-Institut für Zelltherapie und Immunologie. He has promoted awareness throughout Europe of emerging biomedical research and the efforts to reverse biological aging. Editor’s Note: Happy Holidays! If Santa Claus were real, life extension would be the greatest gift that he could possibly give. Elena Milova convincingly illustrates why in this letter, originally published by the Life Extension Advocacy Foundation (LEAF). My name is Elena Milova, and I am from Moscow, Russia. I am a science popularizer, biohacker, and public health advocate in the field of aging and longevity. I am 39, single, and without children, but if you think that I am reaching out to you to ask for a CRISPR-designed baby, I am not. I believe that this type of wish is rather in the pile of letters from China. I am not asking you for a particular health improvement, as one could not wish for a better HOMA-IR (mine is 0.40, because I greatly reduced fast carbs) or total cholesterol level (below 4 mmol/L). I am fine without a new smartphone, too. The thing that I am going to ask you for is much more tricky to get. I want everyone on Earth to realize that biological aging is amenable to medical intervention and that treatments targeting various mechanisms of aging are already in human clinical trials. 7.6 billion minds, one idea. That is my only wish. You have probably noticed yourself that your clientele is changing over time. There are more and more people over 60 in the world, and I assume that the number of wishes for recovery from this or that age-related disease are spiking higher every year. This must be a problem for you, as for many diseases of old age, there is still no effective treatment that would actually help to cure people. It must be frustrating to not be able to fulfill a sincere wish of a good person, especially when a child asks for her grandparents to recover so that they can walk and throw snowballs together. By 2050, the elderly will be a quarter of the global population, and these people will likely be suffering from several chronic diseases at once, gradually losing their health, independence and dignity. For so many people, being a burden on their families because of their deteriorating health is unacceptable, which is why the number of suicides in this age group is so high. Is aging an invisible problem? The numbers of these voluntary deaths are very upsetting, but what is even more upsetting is that diseases of old age are the major cause of death worldwide and aging kills around 100,000 people every day. This is the population of a small city. Imagine what would happen if everyone in a city like Cambridge, Massachusetts were to die in one day. I bet that there would be a lot of media attention and that thousands of experts would be on television discussing the potential causes of death and ways of preventing this tragedy in the future. Let’s say that the next day, another city becomes deadly peaceful. Take the Russian city of Domodedovo, which has its own airport. Everyone dead. People in neighboring cities would probably be frightened, and some charismatic politicians would be trying to calm down the public and promising to do something about all these deaths. The next day, this happens to yet another city, maybe in India. Then another one in Australia. It would not take long before G20 would set up an urgent conference call to set up an international commission and allocate money and scientists to investigate and solve the problem. Sorry, sorry. I didn’t mean to scare you, but you get the point, right? From looking at your pictures, I could suspect that you might have some minor problems with glucose metabolism, but your extensive physical activity during gift delivery should be compensating for that, so you should be fine. For other people aged 60 and older, aging is an ever-increasing problem. Here, we come to the other important issue. What is aging? How it can be addressed? You see, aging is the accumulation of damage that happens due to normal bodily functions. This damage builds up over time, normal cell functions erode, and, at some point, this leads to the manifestation of age-related diseases. Normal operations, damage accumulation, disease, more damage, aggravation of disease, death. Simple. It turns out that at the beginning of this century, British scientist Aubrey de Grey published an article in which he described several types of damage done by aging. He suggested the heretical idea of targeting these damages with medical interventions instead of trying to cure the symptoms of each age-related disease. He argued that age-related diseases are only a consequence of damage accumulation and that it would be much more effective to address the root causes. The seed that Dr. de Grey dropped into the fertile soil of scholarship produced nice fruit in 2013, which is when a group of famous researchers of aging published The Hallmarks of Aging, a paper in which they described nine types of damage that accumulate with age and could be made into new therapeutic targets. Comparison of a mouse treated with senolytics (at right) and a same-age mouse of the control group (at left). Source: Baker, D. J., Childs, B. G., Durik, M., Wijers, M. E., Sieben, C. J., Zhong, J., … & Khazaie, K. (2016). Naturally occurring p16Ink4a-positive cells shorten healthy lifespan. Nature, 530(7589), 184. There were other fruits as well: animal studies have definitively proven that even only addressing one type of damage can extend the healthy period of life, postpone age-related diseases, keep animals more active, and, as a positive side effect, extend lifespan. It is worms that hold the best record so far, as tweaking some of their longevity-related genes has allowed them to live 10 times longer. The results in mice are also impressive – the researchers can extend both their healthy period of life and lifespan by 30-35%. Honestly, I find myself jealous of these mice, sometimes. I would not mind adding another 30% of youthful and healthy years to my life, even if I would have to take some pills or get some regular injections. Can we control aging in humans? You see, Santa, where I am going with this. I am sure that you sometimes leave gifts under the trees of people who work for the FDA. Accumulating a critical mass of knowledge about interventions against murine aging made it possible to develop the same type of interventions for people. Now, drugs and therapies addressing some of the root mechanisms of aging are in official human clinical trials. At some point, some of these trials will be successful, and drugs and therapies targeting aging itself will come to market. If you don’t believe me, here is the short list of people whose chimneys’ stacks are the best source of additional information on the topic: George Church, Anthony Atala, Judy Campisi, Vadim Gladyshev, Maria Blasco, Michael West, Vera Gorbunova, Irina Conboy, Kelsey Moody, Brian Kennedy, Linda Partridge, Alexey Moskalev, Cynthia Kenyon, Claudio Franceschi, Alex Zhavoronkov, Nir Barzilai, and, of course, Aubrey de Grey. He wears a great beard, so you have more in common with gerontologists than you would think. Listen to these people tell their families about their research, and you will get my point. We are on the edge of a revolution in rejuvenation biotechnology. Yet, most people don’t know about it and don’t realize what kind of potential benefit this advancement holds for them and for our aging society as a whole. Most importantly, as they know nothing, they have no say in decision making. How can people possibly speed up the pace of aging research if they don’t realize that aging is amenable to intervention? How can they foster technology transfer and local production of the cures for aging, such as senolytics, in their countries? How can they control prices and make future distribution and access equal? How can they ensure that old people in their families, who need these new treatments the most, would get them sooner? Knowledge is power. We hear this in almost every interview, and you should be hearing it every Christmas from the researchers of aging, too. They have golden brains; the only thing they need is an appropriate amount of funding to solve the problem of aging more quickly. A strong public movement for aging research could be a game changer and could act as leverage to allocate government funding towards researching and developing treatments that target the underlying mechanisms of aging. It is obvious that you are a kind person, Santa. You are perceptive and generous; you know what people want, and you try to give them what they want. However, if you don’t help me with my information campaign, in a couple of decades from now, you will be delivering billions of adult diapers and wheelchairs all over the globe. Wouldn’t it be nicer if you were to pile these up in your warehouse to be covered in dust while you give people therapies and drugs that prevent aging and wipe age-related diseases out of human lives? Just imagine how much happier people would be if they could remain healthy and independent, enjoy full and productive lives, achieve more, and stay with their families and friends for longer. I was a good girl the whole year, attending scientific conferences, interviewing researchers, speaking at public events, and supporting our partners and colleagues in every way I could, even if that much socializing makes me suffer from an introvert’s hangover. I was eating healthy food and promoting evidence-based means to slow down aging among my relatives and friends. I deserve a nice Christmas gift. All you have to do is to let everyone on the planet know that aging is amenable to intervention and that treatments addressing the root causes of aging are currently being created. For real. That would make me the happiest creature on the planet. Thank you in advance! I am 39 years old, and I am an agnostic. There is not much evidence that Santa Claus exists. However, I do believe that miracles happen: the miracles that we create with our own hands. You who are reading these words (thanks for getting this far, by the way!) possess this special power, too. Use it! Let people around you know that science is close to bringing aging under medical control, and let’s build a world where healthy longevity for everyone is a reality. As a devoted advocate of rejuvenation technologies since 2013, Elena Milova is providing the community with a systemic vision how aging is affecting our society. Her research interests include global and local policies on aging, demographic changes, public perception of the application of rejuvenation technologies to prevent age-related diseases and extend life, and related public concerns. Elena is a co-author of the book Aging prevention for all (in Russian, 2015) and the organizer of multiple educational events helping the general public adopt the idea of eventually bringing aging under medical control.